Your meat grinder is a very reliable appliance for your kitchen for a myriad of reasons. There’s a lot of different products and brands to choose from. You need to choose your grinder carefully to prevent impulsive buying and get a grinder that actually works for you. Throughout the guide, we’ll show the specs and information that’s needed to buy the right electric meat grinder. After understanding the specs and what goes into a good meat grinder, you need to decide which one suits your personal or professional cooking needs the best. A large meat grinder can cut through a large volume of meat at a faster rate than competing devices. The cutting rate is measured in pounds/hour. Users who prefer manually operated meat grinders should take in consideration that larger grinders require more effort to use. But, there are some large grinder models that consist of a long crank handle. The crank handle makes it easier to grind meat when using it. If you prefer using an electric meat grinder, you have to check out their motor ratings. This is because stronger and more powerful engines have a higher motor power rating. They have more room for expansion and have more energy when grinding through a large amount of meat. Here’s a rule of thumb, the larger the grinder (electric or manual), the more it will cost. Bigger grinders provide speed. Their only small issue is that you’ll have to use more power to operate big grinders effectively. Your grinder plate’s size is measured by the grinding plate’s diameter, outlet opening, and neck. Make sure to check the plate size before making your first purchase. Here is a table below that displays the different meat grinder sizes. The sizes that you see in the chart are the most popular and common sizes for electric grinders. It also shows the outlet opening’s diameter and how to correlates to the cutting plate. Each electric grinder comes with different motor power ratings. Most motors have a power rating in between 350 to 700 watts. The amount of meat that can be grinded up in an hour depends on the motor. Basically, the stronger the motor, the less time it will take for your grinding machine to cut through the meat. If you plan on using a grinder for commercial use, then you’ll have to buy with a powerful rating since it will take less time grinding up bulk batches of meat. The same principle applies to home owners. You don’t want to have a meat grinder that takes up too much time. Thus, you should get a meat grinder with a motor power between 500-800W to ensure that chops meat effectiely and is an asset to your kitchen. Shoppers tend to ask “What is the best electric meat grinder? The correct answer is “The best electric grinder is one with a large meat capacity”. Meat capacity measures how much meat the machine can chop through in one operation. Check the size of the grinder plate. The meat capacity is directly correlated with the plate size determines the amount of meat you can cut in one operation. Plates that are sized between ⅛ 3/16 and ¼” in diameter are good for making well grounded meat such as franks, bologna, and burgers. Grinder plates that are ½ in size allow users to cut through higher quantities of meat. You’ll find it easier to cut larger meats in size. Also referred to as a medium or coarse plate, larger plates help users create sausages without too much effort. Homeowners should search for a grinder with a low meat capacity. This allows you to have a small grinder while still having enough power to create small meals out of the meat. Professionals can opt for grinders with a size of 22 inches or more to produce a multitude of meat within 40 seconds. Safety: Stainless steel models eliminate contaminants from food that’s bought from the store. Increased Flavor: Users have more control over the fat content and cuts with the machine. Stainless steel grinders can grind meat better than other materials and reduces the chance of oxygen degrading the flavor and nutrients. Better Texture: When you use a stainless steel grinder, it improves the moisture levels and the texture of your food. It’s important to keep your grinder properly lubricated. Oil lubrication helps the grinder’s wheel run at an optimal speed and prevent it from getting exposed to rust. We suggest that you oil the grinder at least 2 times a month to preserve the quality of your grinder. Before you buy, get a grinder that’s relative to your cooking skill level. An electric meat grinder is ideal for first time users. They don’t require any manual input and can grind through meat faster than traditional methods. Manual grinders are great for advanced chefs who have experience. While they require more physical strength, they are used to create authentic meals and can be used without electricity in comparison to electric grinders. No matter which grinder you buy, make sure that you can use it correctly! You’ll reduce the chances of getting injured and you’ll experience increased performance out of the grinder. As a result, you’ll make more interesting and better tasting meals with a grinder you’re comfortable with. After using the grinder, take the device apart and wash out every piece separately. Use soap and warm water to disinfect the device from getting any germs, bacteria, or other ailments. Be careful when you’re washing the parts to avoid any unecessary accidents. Clean the work area by washing out the counter. Wash it before and after you use it to get the most results. Don’t store your grinder when it’s still wet. Allow it to air dry or use a soft towel before you store it. Once you’re done grinding meat, grind up a few pieces of bread. This makes the cleaning process easier by removing debris and fat. Don’t use utensils that have been used for raw meat until you’ve fully cleaned it. Starting off our list is the STX International Meat Grinder. Users like this device because of its three speed 3000W motor, 3 cutting blades, and its sausage stuffer. This gives users the versatility they need when grinding their food. It’s on Amazon at about $163. At a first glance, the STX Turboforce Model has a size 12 grinding head. This large size places it higher than the competition who uses smaller heads that aren’t as effective. It’s created out of 100% polished aluminum and is a helps you cut larger meats with ease. 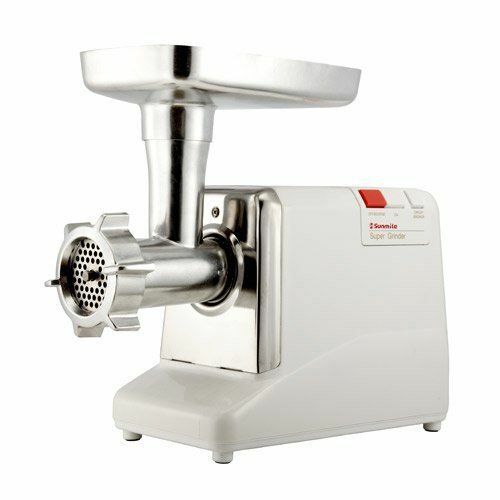 The meat grinder is great for beginners and professional chefs alike. It’s simple to use from the box and comes with accessories such as three cutting blades, tempered steel grinding plates, and Kubbe attachment for more advanced grinding. Durability is an important factor that some shoppers tend to miss. If you can’t get a model that’s sturdy, you’re going to spend extra money attempting to replace it. The STX grinder has carbon steel gears placed on the inside of the unit. These gears never attract rust and can help you grind meat at an extremely fast pace. Grinders with this amount of power and utility are heavy, weighing in at about 50 pounds on average. 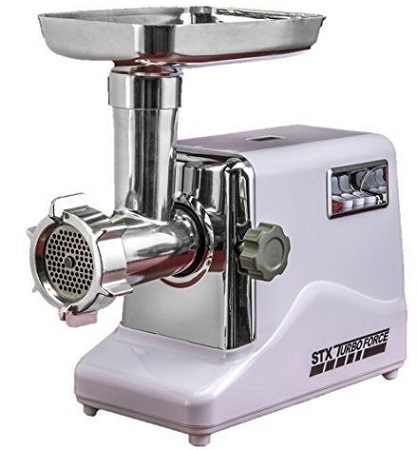 With the STX International Meat Grinder, you’re only carrying about 12 pounds in your kitchen. 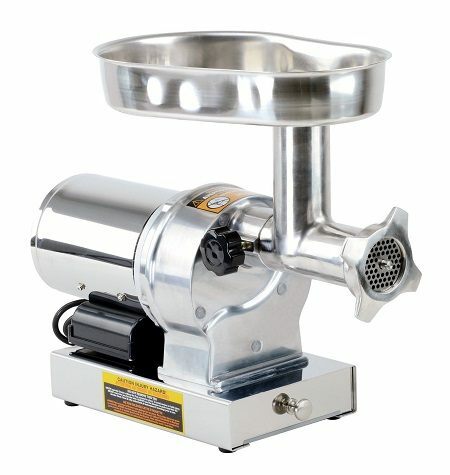 Mainly, it’s a meat grinder that you can store easily while offering a lot of power. But there are a few complaints that the product encountered. For example, the STX 3000 grinder doesn’t have any parts that can be easily washed via dishwasher. You must hand wash each piece after you’re completed with your grinding. Still, the STX International Meat Grinder is the best home electric meat grinder. It has enough features, adjustable speeds, and comes with 12 additional accesories to keep the user satisfied. Buy this grinder today to upgrade your cooking efforts and skills. Ranked second is the Weston 08-0221 Electric Grinder. The grinder allows users to cut up field fresh and farm raised meat within 20 seconds. And, it’s known for having the highest grinding speeds in today’s market. You can get this device on Amazon at a price around $642. Before turning on the machine, make sure you read the user manual that’s included with the grinding kit. Once you’ve fully assembled the grinder, simply turn it on and begin feeding the grinder a few pounds of meat. Keep a bowl or tray underneath the heat to catch and hold the ground meat. One thing that we’ve noticed about the device is its dependability. For example, it comes with an air cooled and permenantly lubricated motor. In addition, it has knife keeps and a stainless steel grinder plate to help the user establish a clean and smooth operation when using the machine. When it comes to speed, the Weston 08-0221 Electric Grinder is the best small electric meat grinder. For example, it has an rifed head design and a offset throat that helps it cut over 18 lbs of meat per minute. This grinder is faster than the competition and is perfect for large bulk cutting. The device comes with a 100% metal gears that are designed for precision and durability. When in use, it releases sounds no higher than 5 decibels. 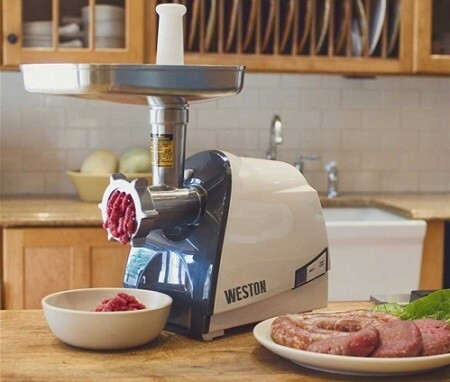 The Weston 08-0221 Electric Grinder is strong and is recommended if you need to cut your meats quietly. However, the lack of a forward and reverse function is one issue that consumers voiced their opinion about. This means that your grinder will be harder to fix if it becomes jammed. Don’t overfill the meat capacity in order to get the most out of this device. The Weston 08-0221 Electric Grinder is the best electric meat grinder for home use. It’s lightweight, and has enough power to cut through premium quality meats without too much manual effort from the user. Purchase this grinder now if you’re ready to make outstanding meals. The Kitchener #12 Electric Grinder is the standard choice amongst commercial chefs and residential cooks alike. It features a ¾ HP motor that has enough speed to cut through 176 pounds of meat in an hour. Find it on Amazon at a price about $343. You’ll like this grinder’s carbon steel frame. This gives a perfect blend of form and functionality because the grinder is resistant to rust while also having a polished appearance. For the meat grinding aficionado, this device is good for you. Safety is an important factor to consider when getting an electric meat grinder. With the Kitchener #12, it has a waterproof switch, a reliable auger, and a meat pusher to help the user remain safe. As a result, there are fewer reports of user injuries when using this device. To further reinforce the concept of safety, Kitchener added an extra circuit breaker on the device. When the grinder is overused, it will automatically shut off to stop any long term damage from occurring. This grinder is great for beginners who still tend to make mistakes in the kitchen. Meat capacity is another priority factor that informed buyers tend to take note of. The Kitchener #12 has a dimension size of 13"x9"x2-3/8". It also comes with an enlarged throat in order to hold more meat. You might want to watch out for the metal accessories that come with the device. If left out for too long, they will become dark and rust easier. As a suggestion, you should continue to clean your grinder to get the most out of it. Overall, the Kitchener #12 Electric Grinder is your one-step solution to your meat cooking needs. With it’s sturdy exterioir cover, a 110 Volt motor, and a speed of 350 Watts, you’ll have no problem using this grinder in your kitchen for everyday purposes. Number fourth on our list is the LEM .75 Electric Meat Grinder. The product has enough power to cut through bones which makes it a great if you have a pet at home. It’s now currently being sold on Amazon at a price about $442. Regarding power, the device runs at a 550 watts and has a 110 Volt battery. This gives the grinder enough strength to create fine cuts out of large chunks of meat. You should get this grinder if you want something that can deliver great cutting results each time you use it. To use the device, start by running it for at least 20-30 minutes at a time. Once completed, give the grinder at least 10-15 minutes to recover. On average, users tend to cut over 376 pounds of meat within one hour using this grinder. A noteworthy feature is the grinder’s Big Bite technology. Big Bite is a feature where the size of the auger is increased. This gives users the ability to cut through a larger bulk of meat without taking time to cut through them by hand before feeding it to the machine. Don’t worry about this grinder getting stuck through the feeding tube. It has a feeding tube size of 2 inches which is an ample amount of space to pass the meat through the grinder. Due to its large feeding tube size, you’ll rarely experience any jams with the device. It also comes with a heavy duty handle that helps you carry and utilize the grinder more easily. The handle also doubles as a base in order to support the meat tray. 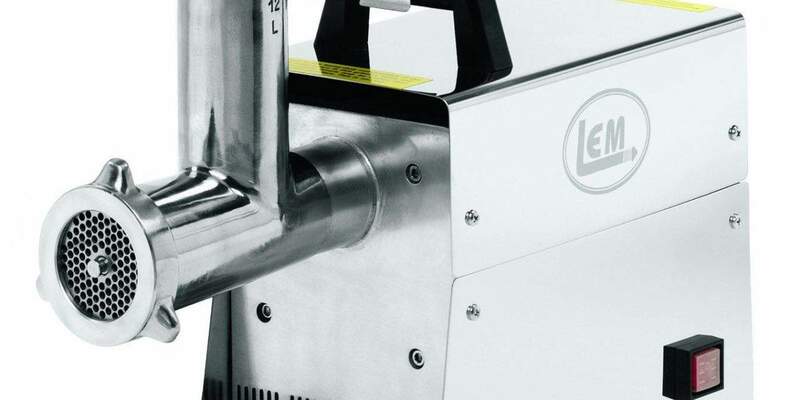 Because of this heavy duty handle, the LEM .75 Electric Meat Grinder has an added level of stability. Unfortunately, the device has a few issues in its performance. Consumers felt that the meat grinder was too heavy to hold. It weighs over 47 pounds, which can be a problem for some novice chefs. Keep this in mind if you plan on moving a lot in your kitchen. 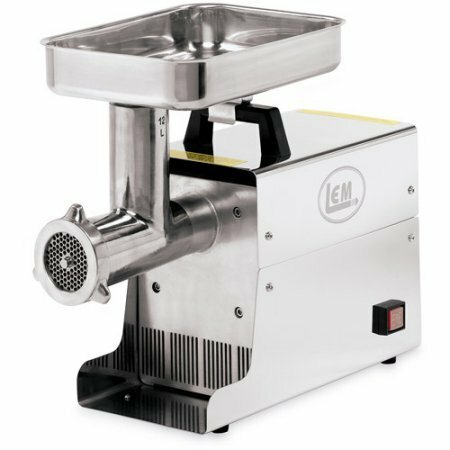 We believe that the LEM .75 HP Electric Meat Grinder is the best low price electric meat grinder money can buy. The device has over ¾ HP of power and reduces the need to worry about it oveheating or clogging. This electric meat grinder is a powerhouse and is great for prep cooking. 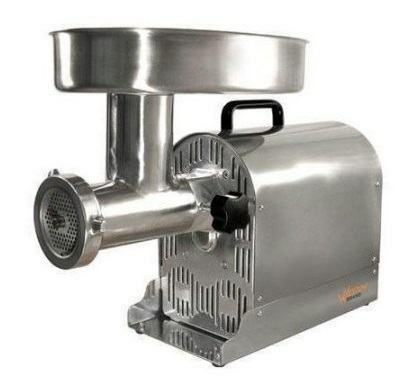 Are you looking for a high performing, and affordable meat grinder? The Sunmille G50 is the best inexpensive electric meat grinder that’s available. It has a wattage speed that ranges from 350-1000W, giving the user the power they need. Find this on Amazon at a price about $154. Competing meat grinders only come with a simple on/off switch. But with the Sunmille G50, it has a multi-functional 4 button switch (ON/OFF, Reverse, Reset). Shoppers like the reverse feature as it allows them to quickly unjam the machine when too much meat passes through it. 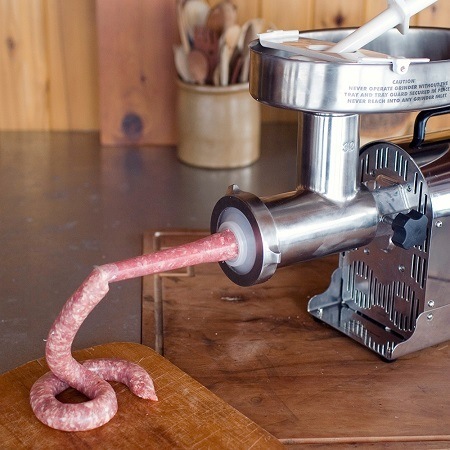 In addition, other meat grinders cut meat a speed of 150 pounds of meat in an hour. Due to the Sunmille G50’s operational speed (300-1000W), it can cut through 200 pounds of meat with no problem. Because of this, the grinder has a great grinding speed and makes cooking a lot easier. Shoppers across the board praised this grinder because it’s easy to clean. Pale in comparison to rival products who are known for rusting and becoming damaged if placed in the dishwasher. Simply use soap and water and this grinder will look as good as new. Another feature worth talking about is the accessories. The Sunmille G50 comes with steel cutting plates, die-cast aluminum head, and an aluminum meat tray. You’ll like this grinder because its accessories extends its usage and help you with your cooking process. We did not find the grinder’s small tray to be of any help. Due to this flaw, consumers didn’t like the small tray because it can become jammed on some occassions. Turn on the reverse setting if problems arise and continue to feed the machine small chunks of meat when using it. All in all, the Sunmille G50 is one of the most valuable meat grinder you can own. It might take some time getting used to the small tray, but users fell in love with the grinder as soon as they started using it. Give this grinder a look if you want the best cooking experience. We’ve taken our time and read the best electric meat grinder reviews. And we’ll have to agree, the Sunmile G50 Electric Grinder. Not only does it have the smallest price point, but it comes at a size of 14lbs making it great for home kitchens. For users wanting a high-end electric grinder in their home, they should look no further. The Sunmile G50 Electric Grinder cuts through meat fast, and still keep the user safe from injuring themselves. Buy this grinder right now if you are serious about making 5-star chef quality meals.